There is a compelling case to be made for Diamond Offshore Drilling, Range Resources, and Devon Energy. The oil and gas industry is a fascinating one to follow these days, and not just because oil is above $70 a barrel. The fits and starts of an industry trying to digest its most significant technological innovation in a century and an epic price collapse at the same time have created loads of compelling investment opportunities for those willing to dig into the nuances of the industry. So we asked three of our energy contributors to each highlight a stock they see in the oil and gas industry that would make a great buy today. Here's why they picked Diamond Offshore Drilling (NYSE:DO), Range Resources (NYSE:RRC), and Devon Energy (NYSE:DVN). Jason Hall (Diamond Offshore): Fellow Fool.com contributor Tyler Crowe recently reported that Diamond Offshore had an operating loss last quarter, a reversal for one of the few offshore drillers that had managed to report an operating profit every quarter throughout the oil downturn. That, along with other concerns across the oil and gas industry, has caused its stock to be one of the worst-performing in the offshore sector so far this year. But I think its earnings release and other bad news in the oil patch are causing many investors to miss out on an opportunity to buy. After all, as Tyler also noted, Diamond Offshore has one of the best contract backlogs on water, including multiyear work for vessels it doesn't currently have in operation. As those vessels leave shipyards and return to or enter service, they will almost certainly push Diamond Offshore back well into the black on both a GAAP earnings and cash flows basis. Trading for less than 65% of the book value of its assets, Diamond Offshore remains incredibly cheap, particularly as oil and gas producers continue to dedicate more money to offshore development. It's squarely in the "buy now" bucket of oil stocks I follow closely. Tyler Crowe (Range Resources): Range Resources has a lot of qualities you would want in an exploration and production company. It has prime drilling acreage in a prolific shale basin and relatively low drilling and production costs, and management is focused on disciplined debt management and growing production without taking on debt to fund it. The one problem that has been a consistent thorn in Range's side has been that the shale basin in which it operates, the Marcellus, is severely constrained by a lack of infrastructure in the region. Shale basins like the Permian benefited from having infrastructures like pipelines and processing facilities in place from when they were sources of conventional oil and gas production. That same level of infrastructure wasn't in place in the Marcellus region, and companies have perpetually been playing catch-up to move gas from the region to centers of demand. For Range, a lack of takeaway capacity has meant high costs for transportation and low price realizations. Last year, Range's average realized price for gas was $0.32 per thousand cubic feet less -- about 10% -- than benchmark prices. Fortunately for Range, companies are building pipelines and processing facilities at a blistering pace. As takeaway capacity becomes more abundant and Marcellus gas can move to multiple demand centers, it should be able to realize prices much closer to benchmark prices. Management estimates that if it can realize strip prices for its gas (the market rate for gas delivered one month from now via a futures contract), it should be able to generate $1 billion in free cash flow cumulatively over the next five years. Range Resources has always had attractive holdings and a low-cost production model. Now that it's biggest challenge is being addressed with more pipes, it looks like it's Range's time to shine. 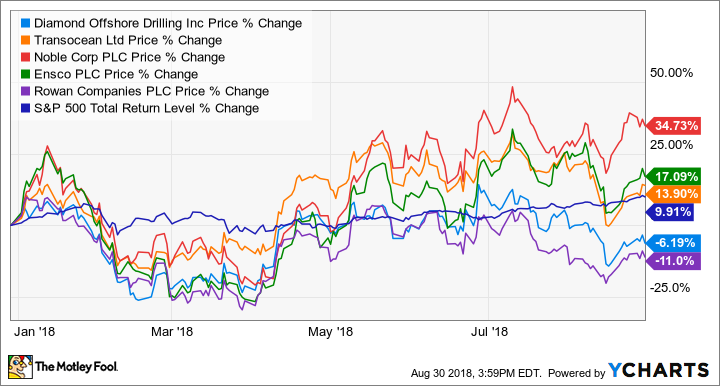 Matt DiLallo (Devon Energy): Oil and gas driller Devon Energy has spent the past few years reshaping its portfolio so that it can prosper at lower oil prices. The company finished up its transformation last year, and as a result, expects to grow production at a mid-teens compound annual growth (CAGR) rate through 2020. That should fuel a 25% CAGR in cash flow assuming oil averages just $60 a barrel, which is well below the current price. In fact, at that price point, the company can deliver that growth while generating an impressive $2 billion in free cash flow. With Devon producing more cash than its business needs, the company has started returning some of its excess to shareholders. Thanks to a boatload of noncore asset sales in recent months, it expects to spend $4 billion on share repurchases through the first half of next year. What's impressive about that number is that it's enough to retire about 20% of Devon's outstanding shares, which is tops in the oil patch. 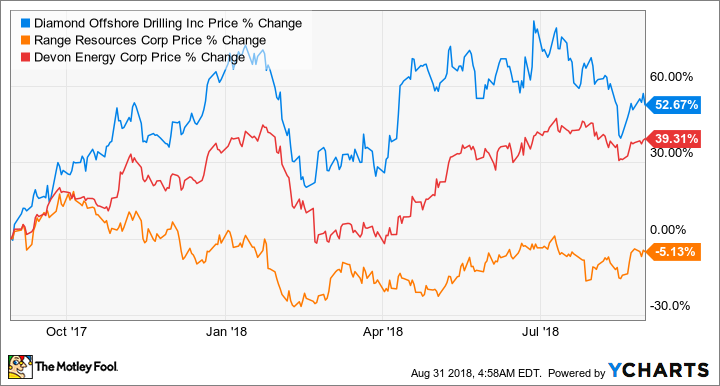 It's such a needle-moving repurchase program that it could fuel significant outperformance for Devon's stock given what smaller programs have done for the share prices of rivals in the past few months. With Devon's ability to grow rapidly even at lower oil prices, combined with its big-time stock purchase program, it's one of the top stocks in the oil patch to buy these days.